I have been seeing Dr. Kulkarni for a few years for routine check-ups and cleanings, and every visit reminds me howgreat she is! Dr. Kulkarni has outstanding skills and a wonderful bedside manner. Her office is professional and courteous. Scheduling appointments is easy and convenient. I highly recommend Dr. Kulkarni! I have been seeing Dr. Kulkarni for a few years for routine check-ups and cleanings, and every visit reminds me how great she is! Dr. Kulkarni has outstanding skills and awonderful bedside manner. Her office is professional and courteous. Scheduling appointments is easy and convenient. I highly recommend Dr. Kulkarni! I am currently pregnant and was having tooth ache and in general needed to see a dentist. The office staff wasnice and accomodating. The doctor was also very nice and advise me on what i should do due to my pregnancy. Would definitely reccomend. I am currently pregnant and was having tooth ache and in general needed to see a dentist. The office staff was nice and accomodating. The doctor was also very nice andadvise me on what i should do due to my pregnancy. Would definitely reccomend. Dr Kulkarni is a graduate from New York University College of Dentistry. She provides highest quality of care by constantly improving her skills and being up-to-date on all the latest trends and technological advances through continuing education. She believes in early intervention and education. She is a proud member of the American Dental Association, which devotes much of its efforts into maintaining professional ethics and high standards of care in dentistry. She has a heartfelt love for dentistry, which is evident in how she cares for and treats her patients. She likes to positively affect patients lives by improving their smiles and general oral health. She also volunteers for charity and community dental services. Tunxis Hill Dental is managed by her with the vision of creating a dental practice that treats every patient with dignity and first-rate care. The assistants and office staff are highly-trained and exceptionally friendly. We understand that for many, visiting a dentist can be a stressful experience. Our comfortable surroundings and compassionate dental professionals will ease your fears. Our mission is to ensure that you receive the best attention and the highest quality dental treatment available, while experiencing unsurpassed comfort in a state-of-the-art facility. We provide dental services for the entire family, with a special emphasis on Family and Cosmetic Dentistry. We strive for optimal care for every patient and believe finances should never be a barrier to achieving and maintaining oral health. We offer many flexible payment options which can fit into almost any budget. We are also in-network with most insurance plans and will file your insurance claim as a courtesy to you. I believe she is a wonderful dentist and would highly recommend her. Excellent!!! Very easy and swift visit! No complaints. Great staff and excellent service. She made me feel at ease and took care of my problems. She is a excellent dentist. I don’t think I would prefer to have anyone else. She makes sure that there’s no pain, and always wants her patients comfortable. Thank you!! I loved the attention I received. She showed me step by step what needed to be done and also told me what my fee would be before anything was done. I appreciate all of that. The doctor was great. I would highly recommend! You will not find a nicer, friendlier dentist in the area. And on top of that, they got me in a day early for the work that I needed! Took great care of me and my wife. We were in and out very quick. She was polite and worked delicately; Pain was minimal (I've not been to a dentist in years). Wife has no complaints. We're planning to go again for other dental needs. 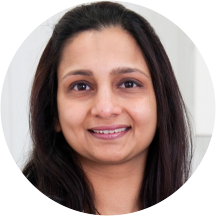 Dr. Kulkarni was great she is very knowledgeable I would recommend! Dr. Meenal was friendly and explained each step of the things she was doing. She provided me treatment options and her office made my visit painless! Awesome, thorough; great Dentist! So glad to have found this practice! Thanks!! The BEST Dental visit I have had in my life! I love Dr. Meena! She is friendly, kind and she has excellent clinical skills. Her office is well run, efficient and clean. I would highly recommend her! I have to say I finally found one of the Best Dentists I have ever gone to who is fabulous! And I have anxiety disorder especially going to dentists. She was gentle, kind, caring, took time to see if I wasokay while working on me. I felt no pain. And she was very professional. I wish I found her a long time ago!! I love her!! I highly recommend her! Patricia O. Excellent experience for a dental visit. I'm a bit of a baby and really dislike going to the dentist. Dr. Kulkarni and her staff were very friendly, professional and attentive. I left feeling very confident entrusting Dr. Kulkarni with my dentalhealth and will definitely recommend her office to family and friends. Quick and helpful. To the point and honest. Dr.Kulkarni saw both my husband and myself. She was wonderful about explaining the procedures and made sure the process was pain free. Dr. Kulkarni was great. Very professional and thorough. I thought it was strange though that she did my cleaning and not the hygienist. Her staff seemed lazy and uninterested. Staff was very friendly and the dentist was very informative. Will recommend to friends who need a dentist.